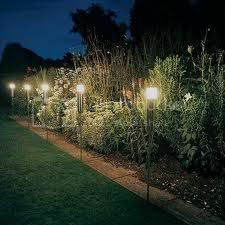 Personal Protection Tip: Homeowners can make their homes less inviting to invaders by installing inexpensive low-voltage exterior lighting systems. Most "Do-It-Yourself" hardware stores carry them and can be set in place by most folks in under an hour or two. Further, most systems can be set up on a timer to become active with the arrival of nightfall. Exterior lighting reduces the cover of darkness and makes it less likely that a well illuminated home will be targeted for an invasion.